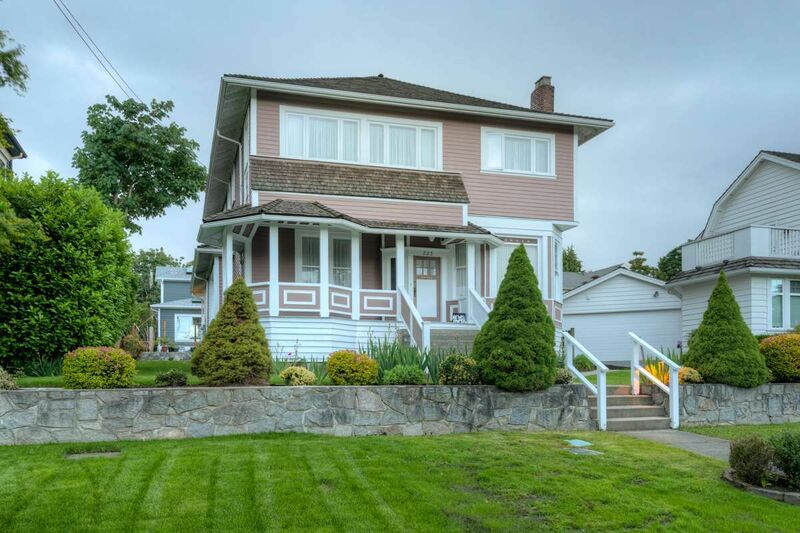 This 1897 Heritage home has arguably the best address in the city! Over 2800 finished sq ft with a 1400 sq ft unfinished dry bsmt. 60' x 100' lot. Mechanically upgraded and maintained by the same owner for over 50 years. Newer kitchen with high quality dove-tailed cabinetry and loads of cabinets. Classic 10' ceilings on both levels. Unique herringbone hardwood inlaid floors, bay windows in living room and parlour. Original wood-burning fireplace, hearth and surround. All original baseboards, doors and windows in place. 6 bedrooms above the main floor. Great views south and southeast from second level. This protected heritage home is waiting for another family to love it and call it home. Walk to Queens Park, skytrain, shopping and schools. Tipperary Park and tennis club at your doorstep.